Would you believe in the fact that a businessman in India, wears a waistband costing equivalent of Thirty Thousand US Dollars or he sits on a chair, for which he has paid a princely equivalent sum of Forty-Five Thousand Dollars or for that matter the silver and gold idols, which he worships daily, are valued at Fifty-Seven Thousand Dollars? At least I did not. It however turns out that these figures are completely true. The person, who uses such expensive daily effects, is Mr. Janardhan Reddy, Managing Director of Obulapuram Mining Co. Ltd; which operates several iron ore mines in the Indian state of Karnataka. The description of Mr. Reddy’s lifestyle however does not end here. Many more aspects that would normally appear impossible in India are actually also true. The table cutlery that he uses daily is made from gold and is priced at Forty-Seven Thousand Dollars. His personal jewelry list extends to three pages and is valued in many Hundred Thousand dollars. This list includes gold ornaments, bracelets, male jewelry, rings, gold idols, ruby and sapphire ornaments. He has large quantities of silver ware for his daily use. As per his income statement his assets are worth 34 million Dollars, his yearly income is 4.7 Million Dollars out of which he earns from his business about 4 million Dollars. A wedding took place in his family for which Mr. Reddy spent about 4.2 Million Dollars. The wedding ceremony took place in the town of Bellary in the interior of the Indian state of Karnataka. 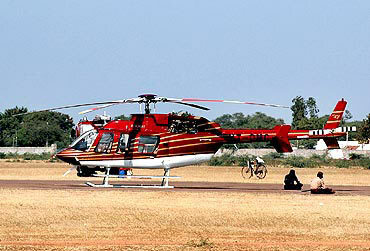 Mr. Reddy had arranged a special helicopter service, to ferry all the guests up and down from Bengaluru, the state capital. Mr. Reddy recently presented a crown to the temple idol of ‘Balaji’ from the famous temple of ‘Tirupati’, located in the Indian state of Andhra Pradesh. This crown made from pure gold and studded with diamonds, costed Mr. Reddy, about 8.4 Million Dollars. What really beats the imagination, is the fact that Mr. Reddy actually got two such crowns made; one was presented to the temple idol and the other has been kept at the Reddy residence in Bellary on a well illuminated special mounting stand made from Sandal wood. This stand is kept rotating all the time so that all visitors can see the display. 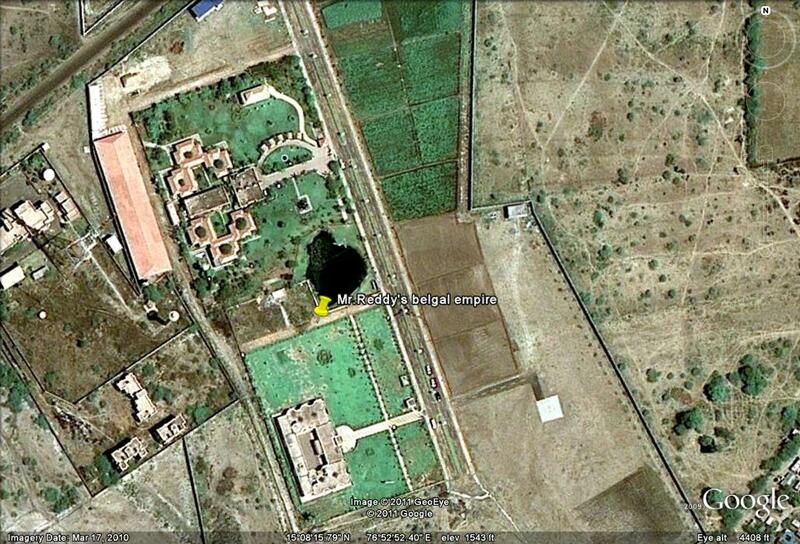 Bellary residence of Mr. Reddy is a huge palace built like a fort. This palace has three levels of security and every visitor has to go through scanners, bomb detection squads and gun toting guards. Recently, Mr. Reddy added a three-story facility near his residence, to enable his children to play games of their choice. His children are not allowed to go outside for obvious security reasons. Suitable children from nearby places and children of some of his associates are regularly invited to the Reddy residence for playing with Mr. Reddy’s children. Mr. Reddy illuminated a small hill, adjoining Reddy residence, at the cost Hundred Thousand Dollars recently. A conference room in this residence, which is used mainly for political meetings, has huge portraits of top leaders such as Mr. Vajpayee of ‘Bharatiya Janata Party or BJP, which is the main opposition party at present in Indian Parliament at Delhi. Mr. Reddy also owns a condominium built near a Bengaluru Five- star hotel, ‘West End’ in one of the posh areas of Bengaluru. He also has a luxury suit permanently reserved on his name in this hotel. All these Reddy residences have fleets of super luxury cars such as Bentley and Mercedes along with few SUV’s. Reddy family spends their vacations around choicest resorts around the world. Few years back, Reddy’s owned three helicopters, which ferried them to Bengaluru for most trivial reasons like having breakfast or a meal in one of the Bengaluru’s five star restaurants. Since business is down these days, they have to make do with only one helicopter at present. The super rich Reddy’s were not born with a golden spoon in their mouth. In fact, his father was a police constable and Janardhan Reddy spent his childhood in a two-room dwelling. After completing his schooling, he took up a job as a Chit fund agent. Later he started his own Chit Fund Company and lost heavily in the endeavor. 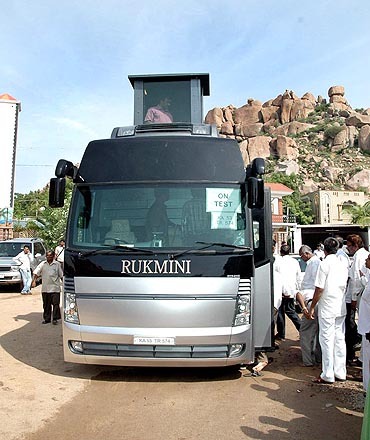 The bus specially built by Mr. Reddy for political campaigning. In 2001, he started the ‘Obulapuram Mining Company and his real growth started. In 2003 turnover of this company had reached 350 million Rupees. But, in a span of just six years, turnover grew to a staggering figure of 30 Billion Rupees. The hilly lands, from where, Mr. Reddy digs out the iron ore, are all open cast mines and belong to The Government of Karnataka. Mr.Reddy’s company has taken this land on lease for mining exploitation. Mr. Reddy has been claiming that his mining operations are perfectly legal and according to the laws of the land. Grave doubts are now being expressed about the tendering process, through which this lease was awarded to Mr. Reddy and whether the compensation, which is being received by the Government is adequate and commensurate, considering the returns, earned by Mr. Reddy. There is another angle to the story. It has been reported that Mr.Reddy’s company is not restricting itself to the lands allotted to it by the Government and continues to mine the ore from other mines also. This large scale mining has reached such mammoth proportions that satellite pictures also have started showing the damage caused to the forest land and the eco systems of Bellary. 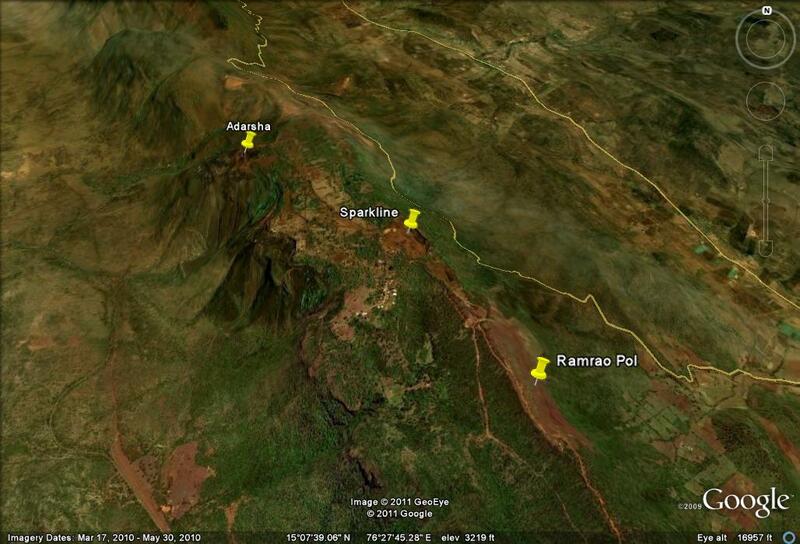 Supreme Court of India took notice of this fact and ordered to stop all mining operations in this area recently. The Central Bureau of Investigation in India, has recently launched an investigation in affairs of Mr. Reddy’s company. Whether Mr.Reddy has earned his wealth in a legal manner or he has resorted to illegal means; the truth should come out in this inquiry. Fact however remains, that by allowing the mining operations to continue on such a large scale and for such a long time, The Government of Karnataka have caused enormous damage to the forest land and the eco systems of the Bellary. This action cannot be justified on any grounds at all.